Presentation of the Official Magazine and Events celebrating the 45th Fiesta de la Vendimia. Conducted by Lola Tomás Ruiz. Editor and Commentator of the Siete Dias Jumilla Group. 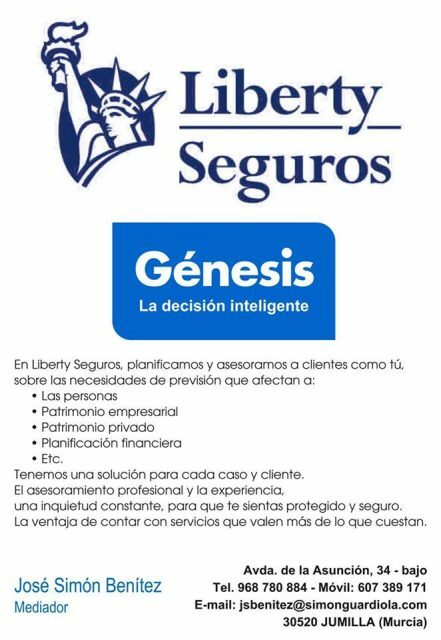 Where: Edificio Roque Baños, Sala Los Gavilanes. Free Entrance. 11:00H Official Reception at the Hon. 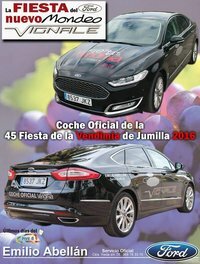 Town Hall of Jumilla to the Herald 2016, Mr. Imanol Arias Dominguez. 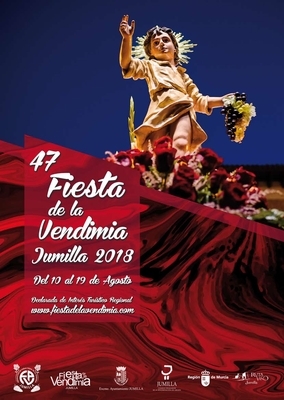 12:00H Official Announcement of the 45th Fiesta de la Vendimia in addition to the awards “Cofin de Oro” and “Colaboración no peñera”. Where: Vico Theatre. Invitation required. Herald: Mr. Imanol Arias Dominguez. Where: Paseo Poeta Lorenzo Guardiola. 12.00h Official Presentation of the VENDIMIADORES MAYORES, VENDIMIADORES INFANTILES and BODEGUERO MAYOR 2016, as icons of the Fiesta de la Vendimia 2016. 21.30h GRAN FIESTA DE LA EXALTACIÓN DEL VINO. Where: Salones Pio XII Restaurant. Santa Ana del Monte. Ticket required. 20:00H Placement and start of the parade held by the Peñas from the head office of the Federación de Peñas to the Town Hall. 20:30h INAUGURATION OF THE FESTIVAL. Starting from the Town Hall. 21:30h Opening of the Wine Fountain. 22:00h Opening of the Stand P.O.D JUMILLA and Casetas Peñeras. 9:00h INDOOR FOOTBALL TOURNAMENT “FIESTA DE LA VENDIMIA” in the Sport Center Carlos García. Organized by Peña La Alborga. 11:00h Shop Windows Decoration Contest. Awards are going to be given at the Head Office of the Federación de Peñas, when the jury ends the visit to all the shops. 19:00h Football Match between JUMILLA CD and any other team in the Sport Centre “Campo de Fútbol Municipal de la Hoya”. 18:00h PISAORES DE UVA Contest, organized by Peña Amigos del Campo at Paseo Poeta Lorenzo Guardiola. 19:00h Grape Throwing National Contest, organized by Peña La Brocá y Dos Yemas at Paseo Poeta Lorenzo Guardiola. 20:30h Spanish Tortilla Contest at Peña El Mantecao’s Caseta. Paseo Poeta Lorenzo Guardiola. 20:00h CHILDREN PARADE. LineUp to be held at 19:30. Goya Street. Itinerary: Calle Goya, Plaza Pablo Picasso, Calle Jaime de Grañana, Calle Trabajo, Canovas del Castillo, Avda. de la Asunción, Avda. Levante para finalizar en el Mercado de Abastos. 18:30h Official Reception at the Town Hall to the maximum icons of other festivals and towns invited to our own festival. 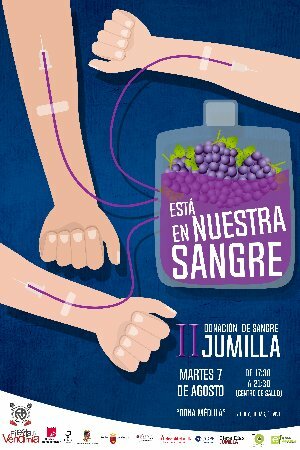 19:30h Solidary Offering to Caritas Jumilla. LineUp at the Head Office of the Federación de Peñas and parade to the place of the offering, Paseo Poeta Lorenzo Guardiola. 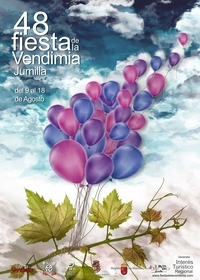 20:00H Peñas Parade from the foresaid Paseo to the Glorieta Garden. 21:00H OFRENDA DE UVAS Y PRIMER MOSTO AL NIÑICO DE LAS UVAS at Glorieta Garden. In this same event, it’s being celebrated the 2nd Edition of “El Chatico Solidario”. 11:00H EXHIBITION OF THE FLOATS TAKING PART IN THE CABALGATA TRADICIONAL (TRADITIONAL PARADE). Paseo Poeta Lorenzo Guardiola. 20:00H TRADITIONAL PARADE LINEUP AND SANGRIA CONTEST. Calle Goya. 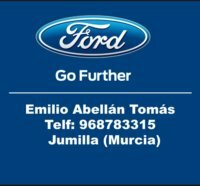 Itinerary: Calle Goya, Plaza Pablo Picasso, Calle Jaime de Grañana, Calle Trabajo, Canovas del Castillo, San Roque, Portillo de los Milanos, Barón del Solar, Avda. Levante finishing at Mercado de Abastos. 8:00H Gachamiga Contest. Near La Hoya Sport Centre. 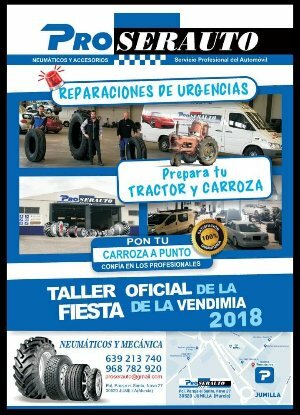 Organized by Federación de Peñas. 9:00H IV PADDEL TENNIS OPEN FIESTA DE LA VENDIMIA at Centro Deportivo Olympia Multisport HeadQuarters. 10:00H LANZAMIENTO DE AZAÓN National Contest. Near La Hoya Sport Centre. Organized by Peña La Horica del Cigarrico. 17:00H GYMKHANA DEL CHATO. Paseo Poeta Lorenzo Guardiola, organized by Peña Hijos de las Cepas. 19:00H FOOTBALL TROPHY “FEDERACIÓN DE PEÑAS” at Campo de Futbol Municipal de la Hoya. 23:00H Monologues Contest. Peña la Alborga. Avda. Levante. 19:00H GRAN CABALGATA DEL VINO. LineUp at 18:00h. Avda. Reyes Católicos. Itinerary: Avda. Reyes Católicos, Avda. de Murcia, Cánovas del Castillo, Valencia, Avda. Reyes Católicos, Juan XXIII finishing on Avda. Levante. Showers are going to be placed for free at Mercado de Abastos. 8:00h ROMERIA DEL NIÑICO DE LAS UVAS. Starting at the Head Office of Federación de Peñas. 10:30h PEÑERO LUNCH. Santa Ana La Vieja. 12:00h Mass Honouring Niñico de las Uvas. Santa Ana del Monte Monastery. 14:00h MATAVENDIMIA PEÑERA. Santa Ana la Vieja.